Visit: Click here to visit. If you've never done yoga with LIVE harp music, how is your chance! 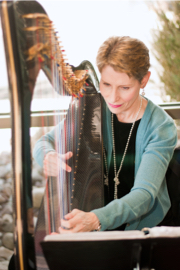 Enjoy the peaceful and relaxing sounds of live harp music played by Grammy® winning harpist Anne Roos while moving through Yoga posturing designed to reduce stress, release tension, and to deeply relax you. Just $25.